Now comes the really fun—and relatively easy—part. First item of business: acquire buckets. 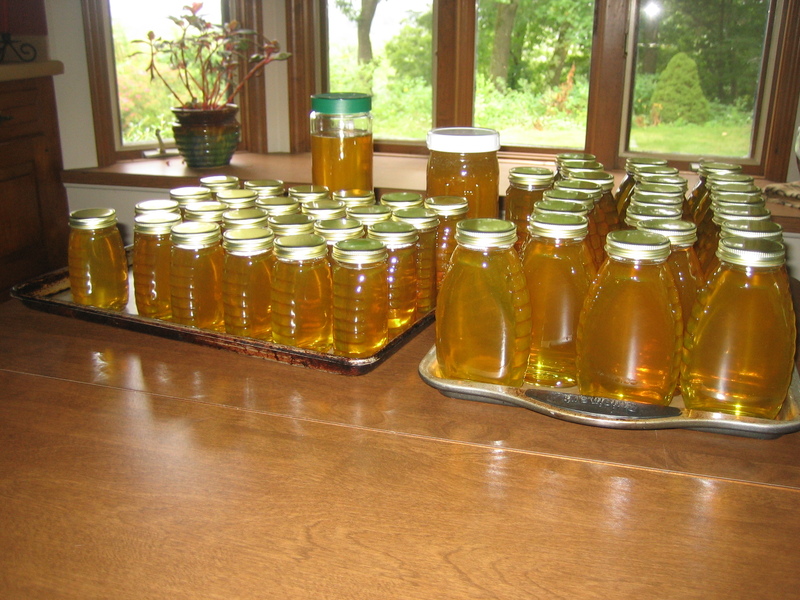 A lot of beekeepers seem to use 5-gallon buckets for storing honey. They’re easy and cheap to come by, and you can get them in food-grade plastic. A lot of bakeries will give them away for free, though they often have a lingering scent of icing or pie filling. Not sure how much that actually affects the honey. You can also get new ones fairly cheap at the big-box hardware stores. Just be sure you get the ones marked “food-grade.” And wherever you get them from, make sure you get lids—and make sure they actually fit the buckets. Got a few from a bakery with the wrong lids; luckily I had way more buckets than I needed, anyway. Wash and dry, and you’re good to go. There are several kinds and brands of honey gates, of course, from the cheap ($12 for mine) to the opposite of that. I was warned that the cheap plastic ones are almost guaranteed to drip, and they do. But I didn’t really find it to be a problem—once you fill a bottle, just put your next empty one underneath to catch the drips while you mess around putting the cap on the filled one. I also found that my gate tends to spill honey from all around the gate “door,” rather than just from the bottom, which does tend to be messy. (You can see it dripping in this video, before I figured out the problem.) 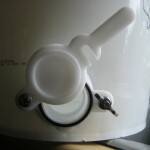 But again, not a big deal—just a very light pressure on the door as the honey drains out keeps it from leaking. Maybe if you’re filling a lot of large bottles and don’t want to stand there and hold the door the whole time, it might be worth getting an expensive no-drip gate. But it wasn’t worth it for me at this time. 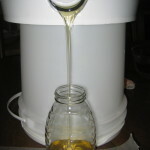 After you extract the honey into buckets, it’s best to wait a few days before bottling. 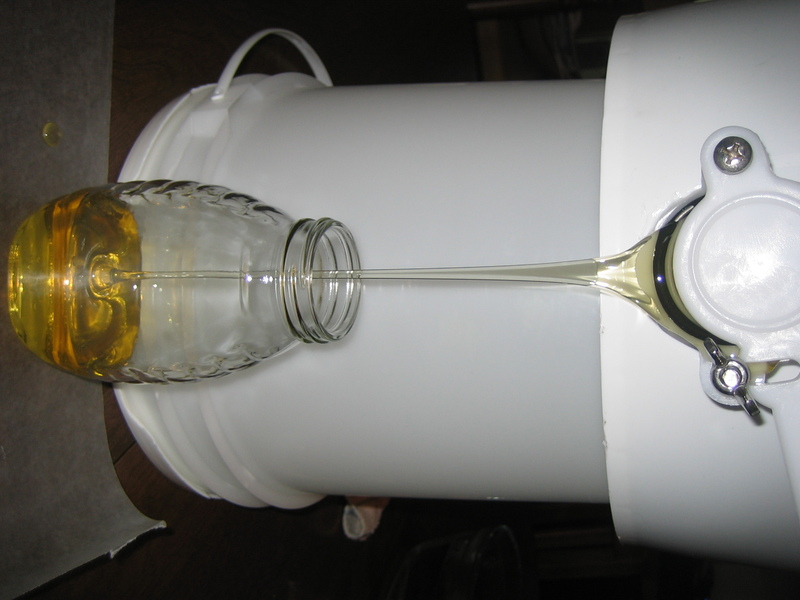 You’re inherently going to get lots of air bubbles during extraction, so letting it sit lets the bubbles rise and makes for clearer honey in your bottles. 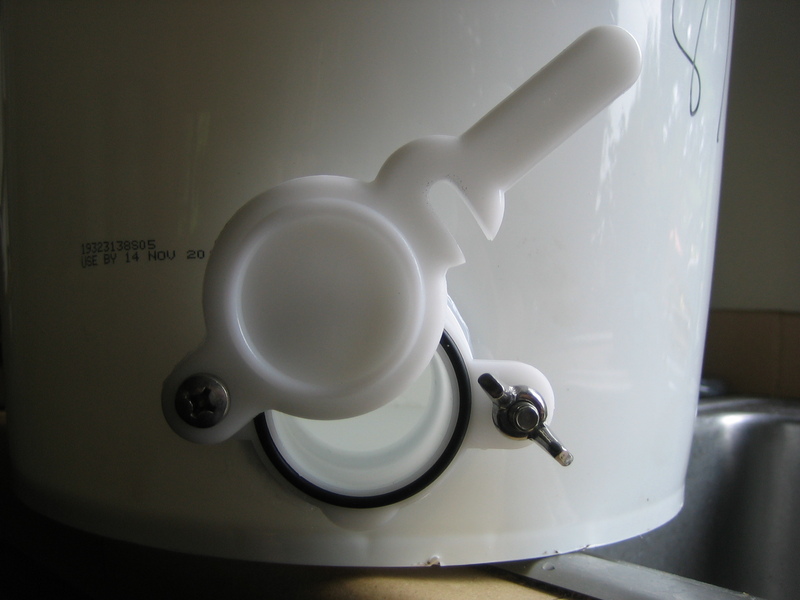 You’ll probably also end up with a foamy film of air bubbles on top (see pictures from my previous post); once you drain your bucket down to the bottom, that foam will get into your bottles. There’s nothing wrong with it—it just doesn’t look very nice. 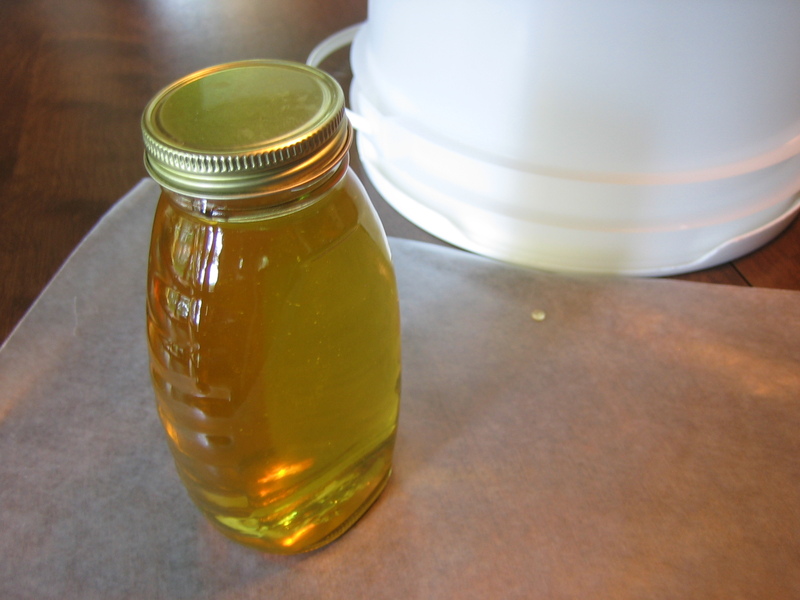 You can scoop it off in various ways before you start bottling, but I found a really good tip somewhere on the interwebs: Take a piece of plastic wrap and press it lightly onto the top of the honey. Lift it off, and the foam comes with it. I was skeptical about it, but it worked like a charm. Took off almost all the foam in one go. 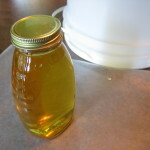 I’ve been told that it’s best to put the cap on the bottle as soon as you fill it, as honey is hygroscopic and will absorb moisture from the air, which you don’t want. So you don’t want to fill all your bottles and then cap them at the end. Cap as you go. Be wary about storing honey long term in a bucket with a honey gate. It seems like a really good idea—you can just bottle it up on demand, rather than guessing how many of what size bottle you need and having to store all those bottles. But a friend of mine did that and came home once to a golden basement floor, due to a leaky/faulty honey gate. So at the moment, I’ve bottled about half of my honey and am storing the other half in a bucket with no gate; I’ll just dump it into the gated bucket when I’m ready to bottle the rest. I don’t know that this happens a lot, but to me, it’s not worth the risk. I can’t even imagine trying to clean up 5 gallons of leaked honey. It should be fine if you set the gated bucket in some other container, though, to catch it if it leaks. I’ll probably try to do this at some point, since on-demand bottling is an attractive idea. 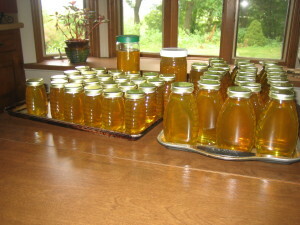 Not nearly as messy as the extracting part of the process, and so much fun to see that beautiful honey all in jars. I ended up jarring half of what I extracted (one bucket full) into 24 1-pound jars, 24 8-ounce jars, and a couple of quart jars. (Note: Honey is sold by weight, not volume, so when you buy an 8-ounce jar, you’re getting 8 ounces by weight, not 8 fluid ounces. Interesting, weird, and confusing.) I then ran out of jars, so I still have a second bucket full to bottle at some point. All in all, a very satisfying endeavor!